SoundCloud Downloader is, like you can probably guess from the name of this free software, a music downloader which you can use in order to download songs from SoundCloud. After installing this free SoundCloud download utility, download links are gonna be added to the SoundCloud player. By clicking on them you’ll be able to save the selected songs as MP3 files with artist and song information preserved. What you see on the image above is what everyone sees when they open up their SoundCloud account. The only difference on this image is the SoundCloud Downloader button, which can be seen in the bottom right corner. This button, as you probably know if you’re a SoundCloud user, is not there by default. You get it after installing this free SoundCloud downloader. 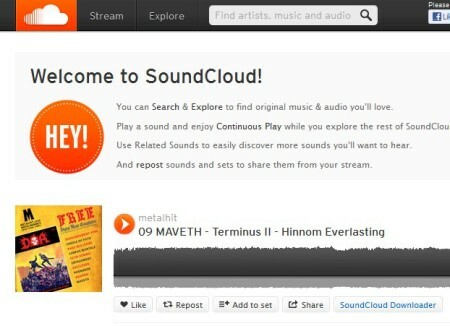 SoundCloud offers a very large number of songs, most of which can be listened and downloaded for free. This is great because unlike with illegal downloads, where you can’t be sure or where you’re somewhere in the gray area when it comes to legality of downloads, with SoundCloud you don’t have to worry about that at all, the legal downloads at least. Here’s a few pointers to help you get started. Using SoundCloud Downloader is very easy, not complicated at all. Like we already mentioned it integrates into SoundCloud, so in order to download songs, you just need to click on the SoundCloud Downloader button that will appear next to the song when you’re browsing SoundCloud. That’s basically the only thing that you need to do. After you click on the download button, the standard Save as window will pop-out. Select the location where you want the song saved and that’s it. The only problem that we had with this free SoundCloud song download utility was during installation. Several different toolbars try to slip their way onto your computer, so be careful. After installation completes, you need to restart your computer so that the changes made to your system take effect, otherwise SoundCloud download button won’t show up on the website. SoundCloud Downloader works on all the major web browsers: Firefox, Chrome and Internet Explorer. 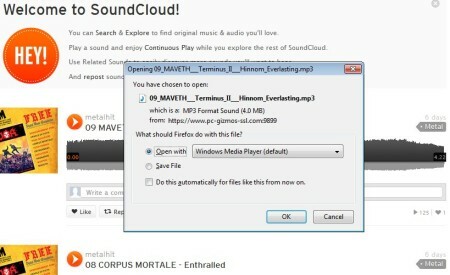 SoundCloud Downloader does everything as advertised. All the fans of SoundCloud, who have created playlists and enjoy listening music there can use this free downloader in order to download music and enjoy it on their MP3 players, smartphones and anywhere else where you don’t have access to Internet. It’s very easy to setup, and it’s even more easier to use. Just be careful when installing, so that you don’t end up with more than what you asked for. Free download.